We spent time this past week reviewing the criteria used to diagnose Asperger’s Disorder, and looked at some of the challenges kids with Asperger’s experience as a result of other conditions frequently associated with the disorder. Today, we’ll use this information to anticipate the obstacles to spiritual growth kids with the condition are likely to encounter. Let’s start with weekend worship experiences. As we discussed on Thursday, kids with Asperger’s are significantly more likely to experience crowded worship areas with bright lights and loud music with discomfort compared to their same-age peers. If the child and their family aren’t regular attenders, doing church represents a change in the typical routine…a situation that is more likely to evoke anger, tears and frustration than in kids without Asperger’s. Maintaining appropriate prosocial behavior may be more challenging for the child with Asperger’s in less familiar environments. The teen with Asperger’s may have more difficulty navigating the social aspects of church. In the churches my family has attended, more teaching and discipleship takes place in small groups as kids transition into middle school and high school. Teens with Asperger’s may be more comfortable in large group teaching than in small group settings. Picking up on social cues in small groups presents a greater challenge. It’s all too common for my teen patients with Asperger’s to tell me they encounter kids at church on the weekend who have been cruel to them during the week. Kids with Asperger’s may have more difficulty responding appropriately during transitions from one church activity to another. Kids who respond well to the weekly Christian education programming may find special events (Vacation Bible School) too overstimulating, or experience difficulty adjusting to a different type of church activity. Similar to kids with anxiety, those with Asperger’s may be more uncomfortable with overnight activities or retreats in unfamiliar places. Lots of pictures, video, and for younger kids, social stories may make it easier for parents of kids with Asperger’s for unique, one-time or annual activities. Teens with Asperger’s are especially sensitive to rejection by peers and have more difficulty overcoming negative experiences of church, compared to same-age peers. Teens with Asperger’s are less likely to have friends to invite them to church, youth group, special activities or mission projects. As a clinician, it would be very helpful to have churches in my area that are deliberately inclusive in engaging kids with Asperger’s…we’re always looking for supportive environments where kids who struggle socially can meet peers who are likely to be encouraging and supportive. In learning and practicing spiritual disciplines, kids with Asperger’s may have a harder time demonstrating sensitivity to the needs of others. They may be less introspective than their peers. They have more difficulty grasping abstract concepts. The classic example…The child with Asperger’s who hears the term “Ask Jesus into your heart” may become preoccupied with the mechanics of how Jesus is going to get inside their body and not grasp the concept being taught. Some kids with Asperger’s may perseverate on negative thoughts and their own guilt when considering the concept of sin. I have one patient from a Catholic family who would perseverate and become so upset when she realized she had done something wrong that a major meltdown usually followed. In second grade she was expected to make her first confession to a priest-her parents were worried about she would handle the situation. Katie Wetherbee had been working with the family around educational issues. Together with the Christian education staff from her church, a plan was worked out for our girl to go to the priest with a list of character traits and behaviors she wanted to improve…an ideal solution for her. Teens with Asperger’s may be more reluctant to try new spiritual disciplines and are vulnerable to developing a spirituality than can become mechanical and ritualistic over time. They may become excessively legalistic in their faith. Corporate disciplines will likely create more discomfort than solitary disciplines. Parents may struggle significantly to engage a child with Asperger’s in learning about the family’s faith if the child doesn’t find the subject interesting. 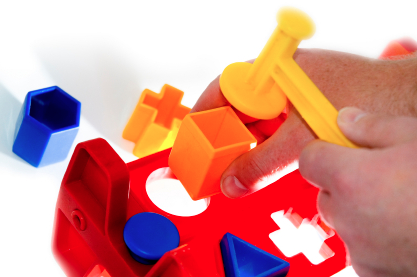 Managing the transitions involved in getting the child ready for church is likely to present more of a challenge for parents of kids with Asperger’s compared to parents of kids with anxiety or ADHD, because kids with Asperger’s will often demonstrate more rigidity or inflexibility when asked to stop a pleasurable activity to move on to a necessary activity. Aggressive behavior is more likely to occur around transitions. For all too many parents, the time and effort required to get the family to church becomes too overwhelming. Teens with Asperger’s may be less likely to engage in family service activities shown to be effective in promoting spiritual development. 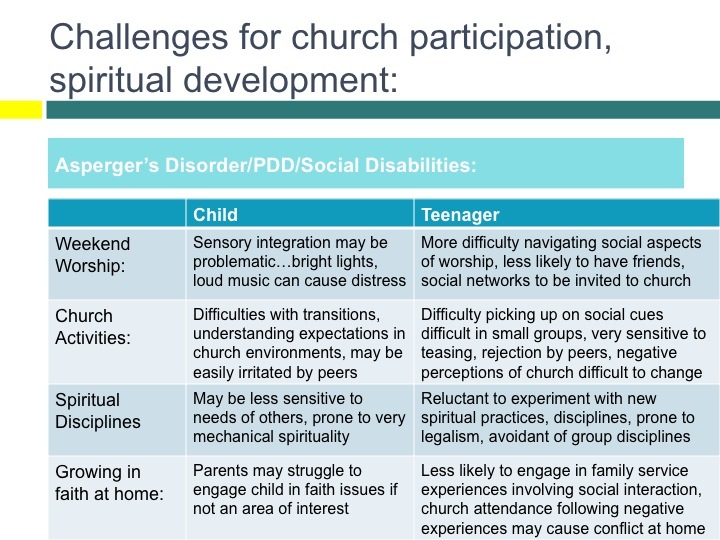 Negative experiences with peers can produce conflicts between the teen with Asperger’s and their parents around church attendance of a greater intensity than seen in neurotypical peers. To join us for the Children’s Ministry Websummit from April 2-6, 2012, click here for downloads of my lecture handout and FREE registration! This entry was posted in Autism, Key Ministry, Resources, Spiritual Development and tagged Asperger's Disorder, Autism, children, Children's Ministry Websummit, church, Katie Wetherbee, Key Ministry, spiritual development, Stephen Grcevich MD, teens. Bookmark the permalink. This is very helpful;, especially in light of this week’s “news” about one in 88 kids being somewhere on the autistic spectrum. You do a great job of offering specific suggestions for each situation they might encounter. Thanks for sticking with it! Thanks for the kind comments…but here’s something to think about…kids with autism represent about 5% of all the kids with a significant mental health issue that can serve as a barrier to the child and his/her family being able to become involved in the ministries of a local church.